Lightweight, open reel is easy to handle and rewind and prevents the line from collecting dirt in the case. Durable, waterproof blade is able to withstand breakage and abrasion under extreme conditions. Non-conductive construction material allows safe use around electrical hazards. 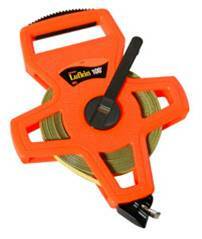 Designed for rugged field use by the surveyor, engineer or contractor. More accurate than tolerances established by the National Bureau of Standards when fully supported with standard tension of 4.5 lbs.